Gangtok is known for nature, historic sites, zoos & aquariums, wildlife, and casinos. 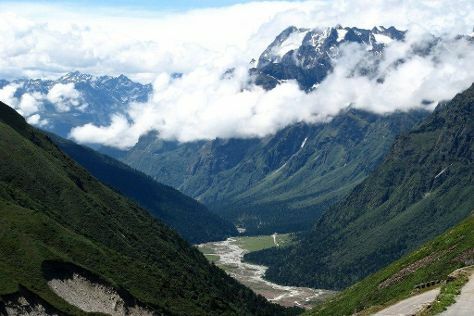 Your plan includes some of its best attractions: don't miss a visit to Nathula Pass, enjoy breathtaking views from Tashi View Point, contemplate the waterfront views at Tsongmo Lake, and take some stellar pictures from Ganesh Tok View Point. To find more things to do, maps, and tourist information, go to the Gangtok travel itinerary planner . Kolkata (Calcutta) to Gangtok is an approximately 4.5-hour combination of flight and taxi. You can also drive; or do a combination of train and taxi. Cap off your sightseeing on the 3rd (Fri) early enough to travel to Lachung. Perched high in the Himalayas, Lachung offers quintessential mountain scenery and small-village hospitality, making it one of India's most beloved destinations. On the 4th (Sat), contemplate in the serene atmosphere at Lachung Monastery, admire the sheer force of Bhim Nala Falls, and then take in the natural beauty of Yumthang Valley. To see more things to do, maps, reviews, and more tourist information, use the Lachung online journey maker . Traveling by car from Gangtok to Lachung takes 4 hours. Wrap up your sightseeing by early afternoon on the 4th (Sat) to allow enough time to travel back home.